Brenda Sleightholme is a resident of Fort Langley, British Columbia, Canada. She has had an illustrious career playing piano and has been a music administrator for local, provincial and national festivals. About four years ago, she returned to painting; the art she loved as a child. 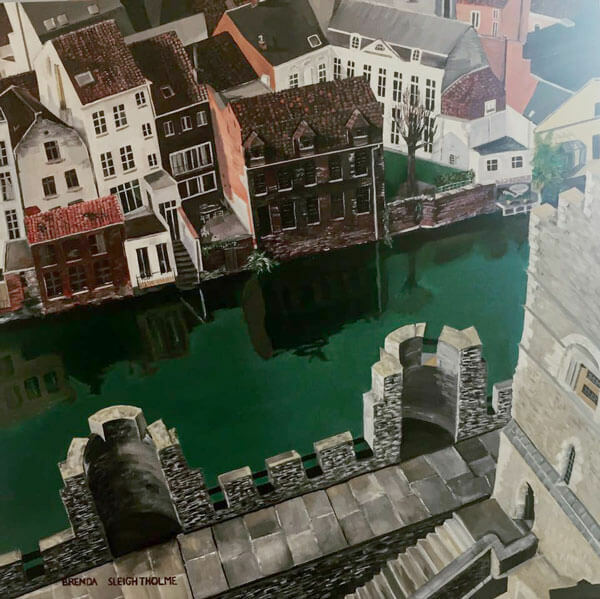 Having raised four children and celebrated the birth of her two grandchildren, Brenda returned to her pursuit of painting. In 2015 she arrived at our September retreat with only a year’s worth of adult experience in the arts. 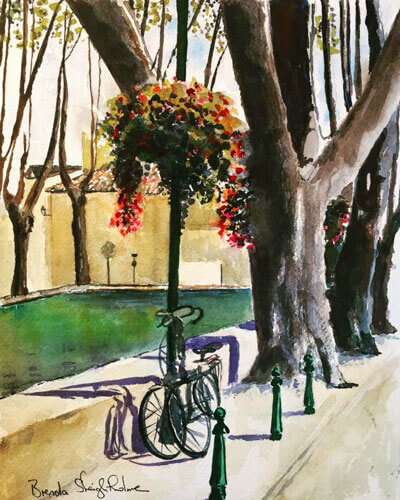 Since that first trip to Workshops In France’s Provencal retreat, Brenda has painted regularly. She now sells her work locally in Fort Langley through local establishments who are happy to create gallery space for her. 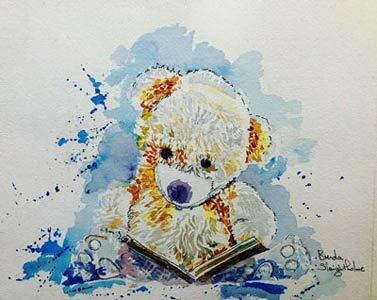 Her “Children’s Series” sells at the Water Melon Tree and she is the in-house painter for Thrive Dance Studio where her “Dancer” paintings are exhibited. 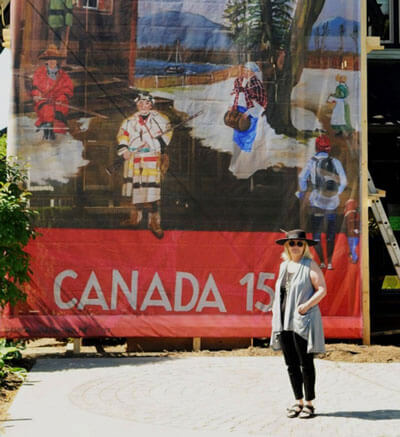 In addition, the National Historic Site in Fort Langley has used Brenda’s work for their 150th anniversary, printing her painting on posters and banners to showcase their sesquicentennial celebration. 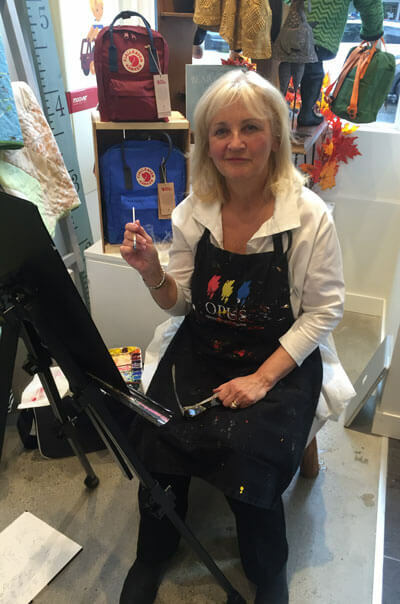 Brenda also helps local causes, donating paintings to The Orangutan Project’s fund-raising events and to the “Cops for Cancer” program. She shares her studio every Wednesday with fellow artists and you will find her there most days happily painting either another large acrylic or watercolour! We interviewed Brenda to find out why she decided to return to our retreats. WIF: How did you first hear about Workshops in France? Brenda: In 2014, I decided to take up painting, mainly to decorate the walls of a newly acquired holiday apartment in Vancouver. I enjoyed splashing old house paint on painters’ drop-cloths and eventually painted something recognizable. 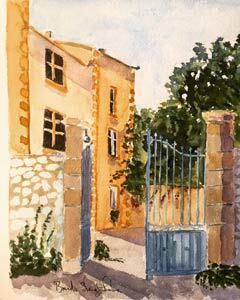 In the spring of 2015, I was perusing the Internet and came across “Chateau Retreat for Artists – Paint Provence, France”. 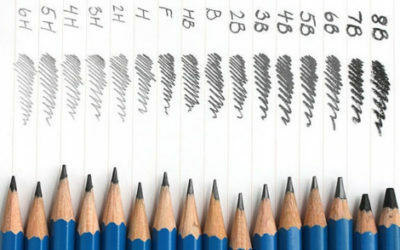 The ad stated, “all levels from fearless beginners to advanced”. By this time, I had painted about five canvases and had bravely painted Goya’s “Charles IV” in acrylics on my dining room wall. That first workshop was a birthday treat from my husband. I immediately wrote to Julie saying I was a brave beginner! The rest is history as I’ve just signed up for my fourth workshop and my initial dabblings have become a passion! WIF: Did your experience at the first workshop meet your expectations? 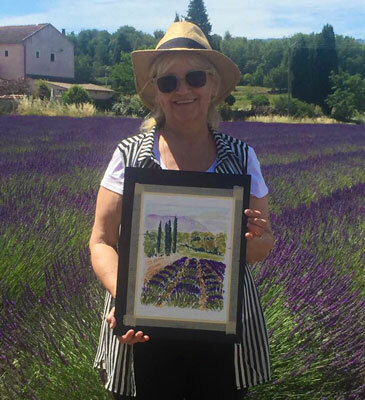 Brenda: The first workshop I attended in 2015 at the Chateau near Avignon, included two Aussie watercolourists, two art gallery owners, a stained-glass artist and some impressionist painters. It was a privilege to look over the shoulders of this diverse group and see what they were painting. 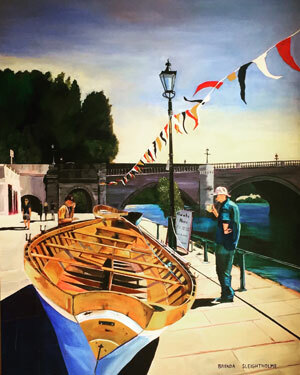 I learned so much from each one – how to paint big, bold, beautiful colours, using loose strokes, unexpected colours and contrasting shadow and light. It was truly inspirational to be part of a great group of people who were willing to share their expertise with me, a novice. I made some wonderful friends from around the world and still keep in contact with these artists. We share our art through social media and I value their critiques of my art. On the itinerary, Julie had organized a wine-tasting at the Domaine de Bois de St. Jean vineyard. Not only was the wine exceptional, but I was inspired to paint the owner. A few months after I returned home I sent a poster of my painting to the Domaine and was thrilled to re-visit the following year and see my poster again. Words can’t really describe how much I valued this first workshop! 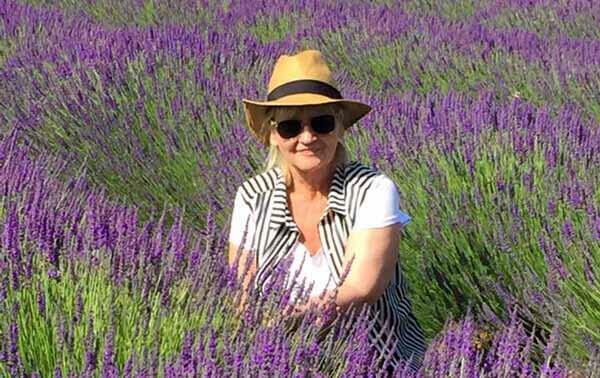 As soon as I came home I had thoughts of lavender dancing in my head for 2016! WIF: You have been to a few of the workshops now. What is it that keeps you coming back? Brenda: Workshops in France has ignited my passion for art. I tell people that I have “designed my life” the way I want to live and part of that design is attending Workshops in France each year. 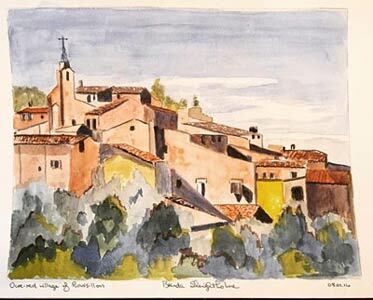 I continue to grow as an artist and my time in Provence anchors that passion. I meet and make friends with the most interesting artists from around the world. I can’t believe there is a better organized workshop out there – the location in beautiful Provence, the food, the wine, the château accommodation, the varied itinerary – Julie and her crew tick off all the boxes for me; from my tentative beginnings three years ago, to being able to say “I’m an artist” now. I am so grateful that I found this workshop. It is an important part of my journey in art. WIF: How has your art changed since taking part in the art retreats? Brenda: I brought acrylics to my first Workshop. It was daunting to set up on a busy street corner surrounded by onlookers pretending to know what I was doing! But, I took up the challenge and felt I had grown immensely as an artist by the time the retreat was finished. On the last day Julie dropped me off at the railway station in Avignon and gave me a refillable water-brush pen. 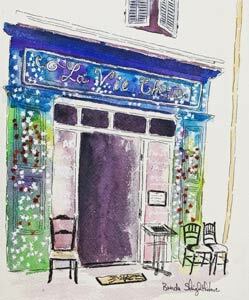 I had a small Windsor & Newton watercolour set, so I started my adventures in watercolour on that last day, happily painting at the station, then on the train and in Paris for a week before returning home. Julie was very encouraging and urged me to keep going on watercolours. 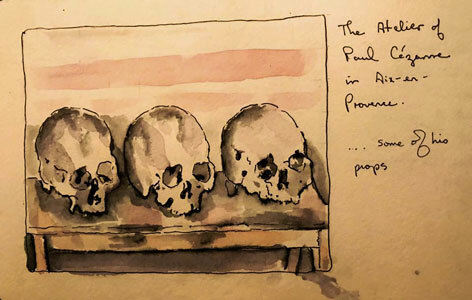 On January 1, 2016 I decided to paint one watercolour every day, and I did just that! I continue with watercolours and acrylics to this day and paint as often as I can. I challenge myself with acrylics and buy bigger and bigger canvases. The most recent being 48″x72″. I challenge myself with subject matter, research various topics and follow many artists for inspiration. When I look back on previous works of art I can see that I am improving as I gain more confidence and skills. This year I did an acrylic painting to celebrate Canada’s 150th birthday. That painting was transferred to a 15-foot x 30-foot scrim which was attached to the front of our house for eight months while we undertook a renovation. It was a tourist attraction in Fort Langley! Today, I am the in-house artist for a ballet studio. I sell art to a local children’s store. I donate my art to worthy causes. I do commissions. And, I supply my extended family and ourselves with art to fill our homes. I have given myself a wonderful gift to share with others and it has enriched my life. Workshops in France is the engine that fuels my art journey! WIF: What new goals do you have for your artistic journey? Brenda: I have asked myself that question many times. At first my goal was simply to decorate a few empty walls with some abstract paint. Then, to buy proper paint, brushes and canvas and paint something that people could recognize. Then, to get better at painting things that people could recognize. 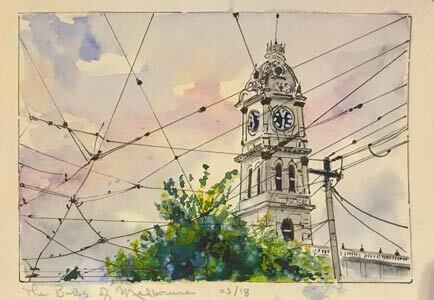 Then I made tentative steps, pushing my art outside of my home and family, boldly asking my local children’s store if they were interested in my watercolours. Recently, I pushed further and solicited a ballet company. Do I want to be commercial? 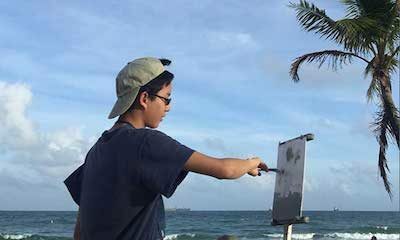 Do I want my paintings to be sold in an art gallery? I’ve asked myself those questions, but I don’t think I’m ready yet. Plus, I am just enjoying the journey too much. I’d like to paint really big acrylic canvases. I’d like to paint watercolours on full sheets. I want to challenge myself with new subjects and see if I can solve the painting dilemmas they present. I want to be a better artist than I am right now. So, my goals are modest for now because I am still in the learning stage. Ask me again in a couple of years and my answer may be completely different as I am never one to shy away from an opportunity! You’ll find her at one of the Workshops in France events at least once a year! 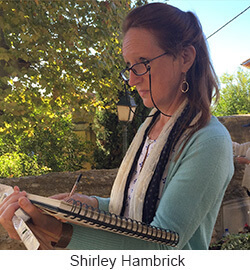 Shirley Hambrick is an award-winning stained-glass artist and painter. She has lived in Scotland, Spain and the USA. 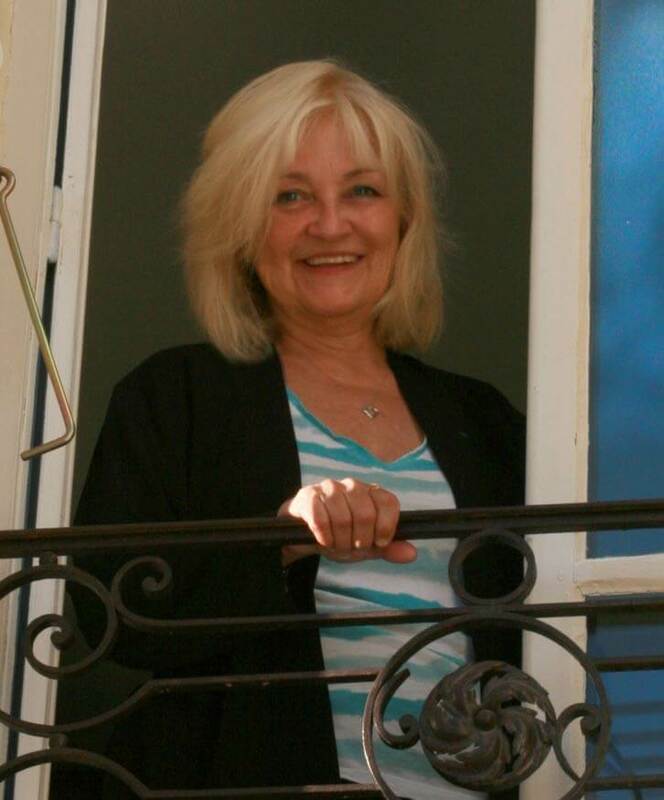 Shirley has been part of the Workshops in France team over the last few years and attended over 10 of these trips. Being Scottish, she was trained at Edinburgh College of Art and Design. 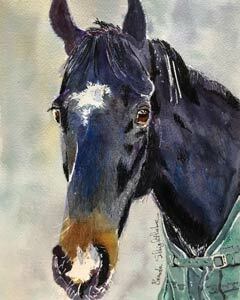 Shirley teaches in the West Virginia area and you can some of her beautiful work here.